The imageRUNNER ADVANCE 8085 model delivers output speeds of up to 85 ppm in black-and-white, single pass duplex scanning at speeds of up to 200 ipm (duplex, 300dpi, black-and-white). Offering standard Color Universal Send, UFR II Printing, and a range of paper handling and finishing options, with the imageRUNNER ADVANCE 8085 model, there's a dramatically better way to work. With its brilliant image quality, exceptional productivity, flexible versatility, and streamlined workflow capabilities, the imageRUNNER ADVANCE 8085 promises a brilliant future for digital print production. New pO toner faithfully reproduces detailed images and text. Halftones and patterns retain their details, diplaying smooth gradations. A number of features have been implemented to streamline steps, helping to compose and manage print jobs and generate ouptut more rapidly. Paper capacity can be extended to a maximum of 7,700 sheets to ensure that long jobs can run without having to stop for paper replenishment. Choose one of two paper decks, a 3,500 letter-sized Paper Deck, or a 3,500 sheet POD Deck Light that supports up to 13" x 19" paper. Choose from a wide range of inline finishing options, including multiposition stapling of up to 100 sheets; automatic 2- and 3-hole punching; professional punching with various punch patterns; preprinted media insertion for covers or page inserts; various folding capabilities including Z-, C-, Accordion Z- and Half-fold; and saddle-stitching and face-trimming of up to 20-sheet/80-page booklets. 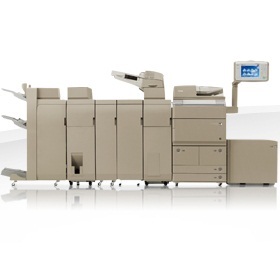 In addition to standard UFR II printing, this system offers a variety of print options including the ability to add a PCL print option or an Adobe PS 3 option. For more heavy print volume environments, add the imagePASS-U1. New pO toner and new Induction Heat fusing system help to reduce overall energy consumption by minimizing heat and power requirements. Power consumption for sleep mode is 1.5W or less. Dimension 49-1/4"* x 53-3/8"** x 30-3/8"
Dimensions 41" x 25-3/4" (30-3/4"&Delta') x 30-1/8"
Dimensions 41" x 30-1/4" (35-1/4"Δ) x 30-1/8"
br>Dimensions (H x W x D): Professional Puncher-C1: 41" x 12" x 31-1/4"
Integration Unit: 41" x 9-7/8" x 31-1/4"
Dimensions (H x W x D): 55-3/8" x 29-3/8" x 31-1/4"
Dimensions (H x W x D): 46-7/8" x 13-1/4" x 31-1/4"
* To the top of the Upright Control Panel in the standard position. -� Standard color scan support is up to 300 dpi. Up to 600-dpi scanning requires Additional Memory Type B (512MB). -�-� EPS and XPS cannot be printed directly from the Memory Media or Advanced Box. -�-�-� Coated paper can only be loaded through the Document Insertion Unit-K1. �� Browsing Advanced Box using SMB is not supported when imagePASS-U1 is attached. �� Requires Staple Finisher-D1 or Booklet Finisher-D1. ���� Requires the Copy Card Reader Attachment Kit-A2. ������ Requires PCL Printer Kit-AH1. �� Requires PS Printer Kit-AH1 or Direct Print Kit (for PDF/XPS)-H1 when printing PDF files. ���� Check with your Authorized Canon Dealer for availability. �� Requires USB Device Port-A1. ���� Required for 600-dpi color scanning.